Need funding for your next project? This Directory features companies that focus on providing funding to energy-industry firms. 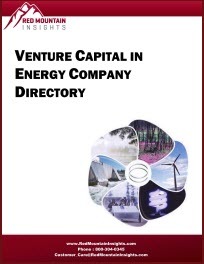 This Directory of venture capital firms, angel investors, and government funded energy research centers is a must-have resource for energy-industry professionals seeking VC funding for new projects or business growth. Energy-Focused Venture Capital Firms, @Ventures, Advanced Technology Ventures, Advantage Capital Partners, Altira Group, Applied Ventures, Atel Ventures, Atlas Ventures, Battelle Ventures, Battery Ventures, Bay Partners	, Bessemer Venture Partners, Braemar Energy Ventures, Burrill & Company, CMEA Ventures, Canaan Partners, Chevron Technology Ventures, Chrysalix Energy Venture Capital, Commons Capital, Crosslink Capital, DTE Energy Ventures, Digital Power Capital, Doll Capital Management, Draper Fisher Jurvetson, Duff Ackerman & Goodrich Ventures, Element Partners, Endeavor Capital Management, EnerTech Capital, Flagship Ventures, Foundation Capital, Garage Technology Ventures, Globespan Capital Partners, JumpStart Inc., Khosla Ventures, Kleiner Perkins Caufield & Byers, Lightspeed Venture Partners, Massachusetts Technology Development Corporation, Mohr, Davidow Ventures, and More. The second part to this directory is a spreadsheet of 306 VC firms showing their area of expertise, full contact information including email address in most cases. This comprehensive directory provides business leaders, business development, sales, and finance professionals in the energy industry leads for financing projects.